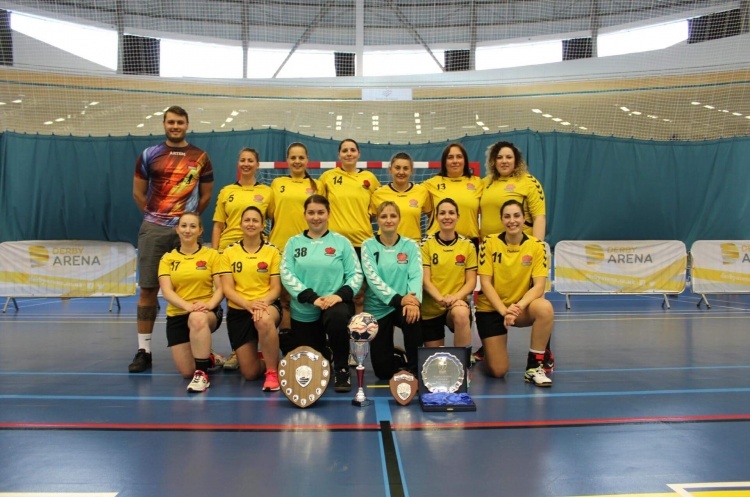 Fresh from their victory in the 2018 National Shield, Reading Lionesses are ready to take their place in the top tier of English handball – and they plan to do it with smiles on their faces. Lionesses were crowned Regional League South East champions last season, won promotion to the top flight via the play-offs, and lifted the National Shield in a spectacular 2017-18 where they remained unbeaten in all competitions. They achieved that promotion after beating Loughborough University 20-13 in the National play-offs. Szabo says key to their success on court is the attitude of the players. She added: “We are a very positive team – we never take the attitude of ‘we can’t do it’. We go there with a lot of fun and passion in our hearts. From the outside, when they see us, we all do our thing – everyone knows their body really well, so everyone is their own coach when it comes to warming up and making sure they are ready for the match. The Lionesses are coached by one of the men’s players, who put himself forward for coaching qualifications this year. Szabo says Artem Kuybida has a fantastic eye for tactics and selection, as well as team morale. “He’s got a really good eye when it comes to coaching. He’s got a lot of knowledge, and he can put tactical stuff into a very light-hearted message, so everybody can get it. “And that together with all the players, being able to put everyone’s heads together – that’s what has led to the success." So having made it to the top flight, where the Lionesses journey to east London to play Dagenham-based London Angels on the opening weekend of fixtures on 8/9 September, what do the Berkshire women hope to achieve?